Record numbers, over 600 people, attended Close It 2017. This year, ACT participated in Innovate + Educate’s annual Close It Summit, and we were this year’s Innovation Sponsor. ACT and Innovate + Educate have worked together for many years and share interest in innovation, access, and closing the employment opportunity gap. Our participation and sponsorship is important because there has been a long standing disconnect between K-12, post-secondary, and the workforce that the Close It summit bridges together. Connecting philanthropy, for-profit, nonprofit, government leaders, and other stakeholders is vital to creating a successful workforce ecosystem where all students can have equitable access. We were thrilled to be part of this year’s events and further ACT’s mission of helping people achieve education and workplace success. Jim Larimore’s panel, Advancing Talent Through a New Lens “Filtering In,” discussed filtering in applicants and not out. Turning the way we evaluate talent upside down—what if we created an inclusion tool versus an exclusion tool for hiring? We would get a more diverse talent pool and lower the barrier to entry. Sean Sullivan, vice president of human resources at Tufts Medical Center is embracing a grassroots effort to create upward mobility and pathways for the medical field. 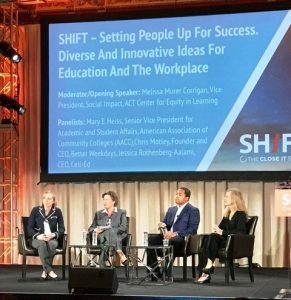 In addition, I moderated an active and engaging panel, Shift—Setting People up for Success. Advocacy, partnerships, and the importance of community college were the focus of this panel with an emphasis innovative technology to support acquiring basic skills. Matching talent and personalized career pathways and bringing essential skills such as literacy, language and job skills was highlighted. Community college is an important connector to upward mobility for all students, especially underserved populations and communities. Mary Heiss, senior vice president for academic and student affairs at the American Association of Community Colleges, highlighted the importance of advancing student access, diversity, and success in community colleges. Given that one-third of first-generation students are at community colleges, community colleges create a significant connection with the local community and economy and provides successful pathways for students. If we close the gap between education and career, we will create more pathways for students, not just a privileged few. Diversity and inclusion is at the forefront of ACT and having a diverse and inclusive workplace strengthens our company and creates an inclusive culture. The summit connected workforce, education, community, and business in a way that is important for creating successful pathways. At the Center, creating equitable opportunities for all students is key for us and in that, strengthening our partnerships and creating new ones will help us all work together to achieve our goals. We look toward to Close It 2018 in Brooklyn, New York. Follow us on Twitter at @ACTEquity for updates on our latest initiatives.